The most famous sapphire in the world comes from Kashmir. Kashmir Sapphire ​is highly valued because the best specimens have extraordinary cornflower blue and are sleepy (due to rutile inclusions) which have been described as "blue velvet". Some of the best Ceylonese and Burmese sapphires are approaching, but Kashmir sapphires continue to be the peak in the sapphire world. Kashmir Sapphire rarely appears even at high-end auctions. 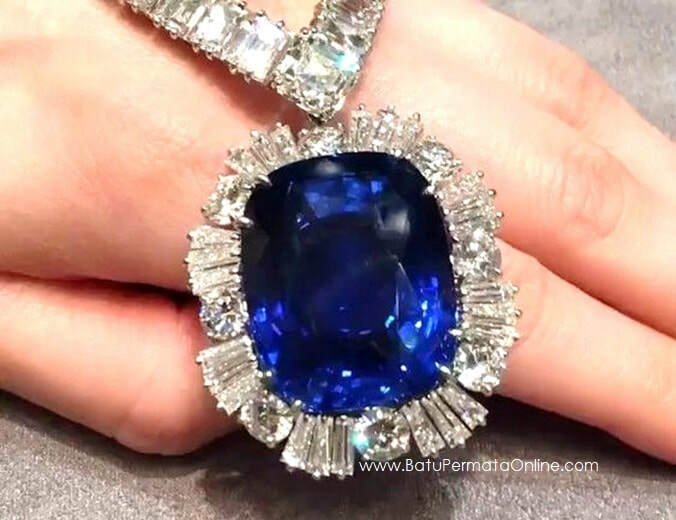 In April 2007, a 22.66 carat Kashmir sapphire, mounted on a pendant surrounded by diamonds, was sold at Christie's auction for $ 3,064,000 to anonymous bidders. At $ 135,000 per carat, it sets a new record for sapphire. Some gem experts describe these pieces as "good stones", which shows that they are far from the best sapphires from Kashmir. This is the scarcity of these stones that make the price so high. Kashmir is in the northwestern region of the Indian subcontinent, located in the valley between India and Pakistan. An area with beautiful natural beauty, Kashmir is a graceful country in the 19th century. This became a disputed area after the division of the subcontinent in 1947, when he joined India and not Pakistan. Disputes continue to this day, with parts of Kashmir occupied by Pakistan. Sapphire was first discovered in Kashmir around 1880. The story is a landslide in the Padar region found a deposit, high in the Himalayas around 4,500 meters. Between 1882 and 1887 the mine was very productive, producing exceptional quality and size sapphire crystals. British geologists found that the original mine had run out of energy and turned its survey into a placer deposit elsewhere in the valley. However, subsequent exploration failed to reveal significant new material. Over the years, occasional geological surveys have been carried out and mining efforts have been carried out for three summer months where the area is free of snow. However, the miracle that came out of the original mine was never appropriate, and at present the area is largely under the control of the guerrillas. Are there more than amazing ingredients that can be found in this Indian Himalaya.